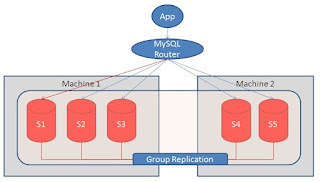 MySQL Group Replication has been released since MySQL 5.7.17. If there is a network partition between a group of Servers, it may introduce arbitration to find out and determine the next action for the Group of the Servers. This blog is written to introduce my 'demo' version of arbitrator / watchdog. From here onwards, I refer this arbitrator as gr_watchdog. The following table is an example of the configuration for the Group Replication. The 5 servers are all connected as Group Replication thru INTERNAL Network Interface. The setting below tells each of the member server to connect to “interface:port”. “primary|secondary” on the machine can be the interface to INTERNAL Network dedicated for Group Replication. Application connecting to the MySQL Servers is going thru another Network Interface. MySQL Router is used as the routing between MySQL Servers and the Application(s). 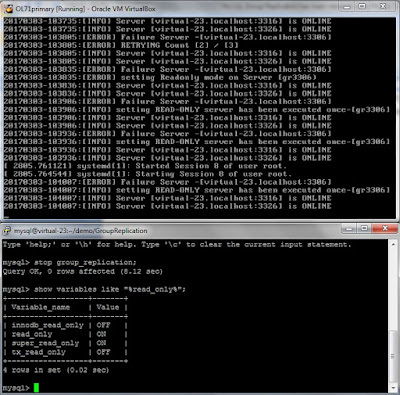 The following screenshot shows the 5 MySQL Instances running on 2 machines (virtual-23, virtual-24). 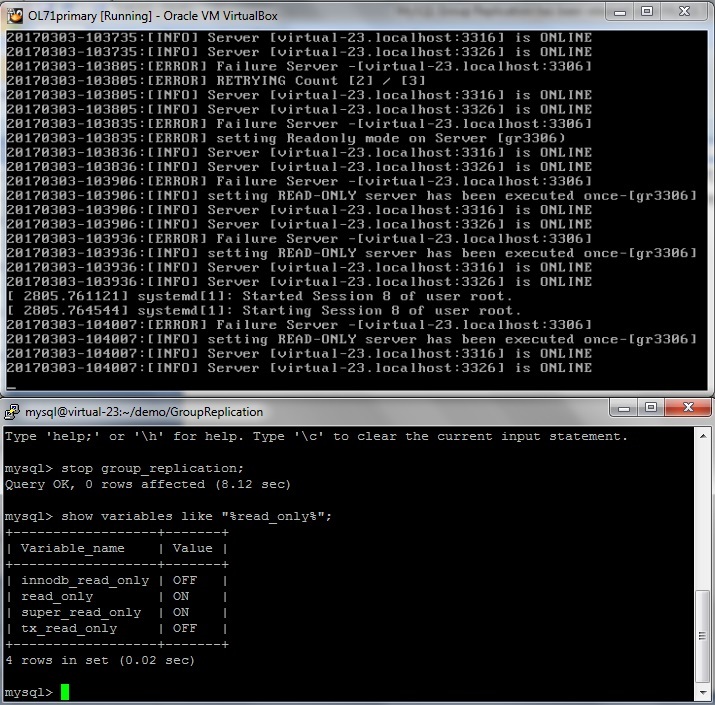 Given that the virtual-23 has 3 MySQL Instances and virtual-24 has 2 MySQL Instances. They are all running with ONLINE state. If there is any problem to the INTERVAL Network Interface between the 2 machines. MySQL Instances (S1-S2-S3) is separated from (S4-S5). It forms 2 group of Servers which they are disjointed. On the Majority Group with the Machine 1 (virtual-23), all three Server S1-S2-S3 are connected as ONLINE. The size of the group becomes 3. Where as On the Machine 2 (virtual-24), the Group Size is still 5 but only the 2 servers are ONLINE. The size of 2 is a minority with regards to the Group Size as 5. The above diagram shows the Member State of Machine1:virtual-23 on the Left Side. The Member State of Machine2:virtual-24 on the Right Side. Machine1:virtual-23 has 3 ONLINE members in the Group. Machine2:virtual-24 has 2 ONLINE members out of the 5 member size in the Group. 3 members are marked as UNREACHABLE. Application if connected to this minority group (S4-S5) Servers may have uncertainty with data. Updating data is prohibited by the nature of the Group Replication Architecture. 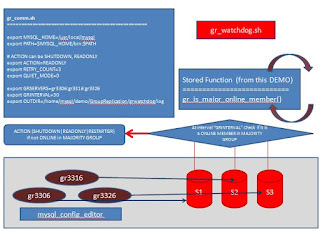 The gr_watchdog is shared as illustration to detect the member state in the group and take action (SHUTDOWN | READONLY | RESTARTGR) on the server(s). 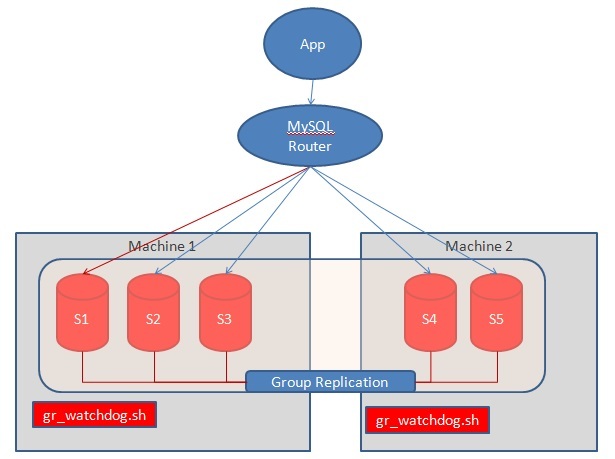 A script “gr_watchdog.sh” is created to monitor the local MySQL Servers on the machine. --login-path which is created by mysql_config_editor. 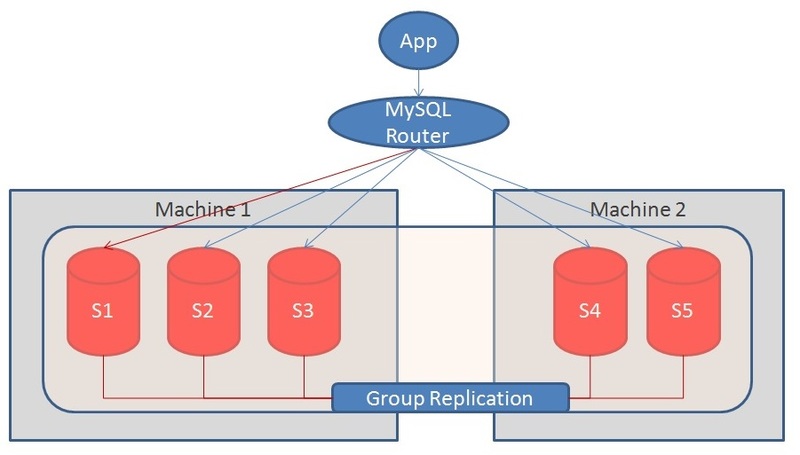 If MySQL servers are in a Group Replication and they are all connected, executing the stored function creation on any of the server instance will be able to install the Stored Function to all server instances. The gr_comm.sh contains the configuration settings. To illustrate the gr_watchdog for the ACTION=READONLY; while ALL member servers are running, issue “stop group_replication;” on one of the server. After retrying up to RETRY_COUNT=3, the server is set to READ ONLY – including READ_ONLY and SUPER_READ_ONLY. To enable the GROUP REPLICATION, be sure to disable the READ_ONLY and SUPER_READ_ONLY if the “group_replication_single_primary_mode” is not set to TRUE. Any comment, appreciate your sharing!!! Again, the is just a demonstration how we can create external arbitrator / watchdog for MySQL Group Replication Servers.